When do cuts, bumps and bruises require medical attention? | Checkup | Kids VT - small people, big ideas! When do cuts, bumps and bruises require medical attention? Cuts, bumps and bruises are an inevitable part of childhood. Parents have to assess everything from skinned knees and "goose eggs" to the occasional sprained ankle or broken wrist. When is an injury serious enough to warrant a trip to the emergency room? This month, Lewis First, head of pediatrics at Vermont Children's Hospital at Fletcher Allen Health Care, offers advice for when kids go clunk. KIDS VT: How should parents treat a child's cut, bump or bruise? LEWIS FIRST: First, parents should remember that the vast majority of cuts, scrapes and bruises can be handled at home. So step one is for parents to stay calm, cool and collected. If you stress, your kids are going to stress, and it's going to make it a lot more difficult. With a cut, the first step is to clean it. Even if the cut is bleeding, try to expose it to water under high pressure for one to five minutes. It may start bleeding again, but that's OK. Once the cut is cleaned, apply pressure with a sterile gauze pad, or just a clean cloth, for five to 10 minutes. And don't peek! If you can hold the extremity above heart level, even better. Once the bleeding stops, put an antibacterial ointment on before the bandage to prevent germs from getting in. KVT: When does a cut require stitches? LF: If the cut is still bleeding after two rounds of applying pressure, that's a reason to go to the emergency room. Also, if the cut is more than a half-inch long or more than a half-inch deep, you should seek medical attention. Other reasons to go are if you think something is stuck in there, such as broken glass, or if it's a laceration to the face, chest or back, which can scar. While you're there, make sure your child's tetanus shot is up to date — that is, within five years. KVT: How do you know if a bone is broken? LF: A classic break is characterized by pain, swelling and deformity — that is, a lump or change in the bone's position. In small children, bones are more likely to bend and partially break. Older kids are more likely to have complete, through-and-through fractures that may even poke through the skin. That's a serious emergency and requires immediate attention. KVT: What should parents do about a fracture that dislocates the bone? LF: Don't try to relocate it. Keep the limb exactly where it is. Parents can put some padding, such as rolled-up towels, around the limb, then place it on a board and splint it with first-aid tape, ice it and head to the emergency room. If parents don't know what they're doing and try to pop it back in place, that can result in more pain, additional fractures and even pushing the bone through the skin. LF: Sometimes parents will confuse a fracture with a sprain of the ligaments, which are the bands of cartilage that attach bone to bone. Those injuries can also cause pain and swelling. Typically with a fracture, the child doesn't want to move that arm or leg at all. If there's any question, parents need to seek medical attention and get an X-ray. Whether it's a suspected break or sprain, wrap an ice pack in a towel and put it on the injury. Don't try to get an injured arm or leg in or out of clothing. Finally, with any bump, bruise or swelling without blood, just remember the acronym RICE: Rest, Icing, Compression and Elevation of the limb. KVT: What should parents do about a head injury? LF: With any serious blow to the head, neck or back, leave the child where he or she is until an ambulance arrives. If there's loss of consciousness, obviously, seek medical attention and don't let the child get up when he or she regains consciousness. After a minor head injury, parents should observe the child for the first two hours for signs of a possible concussion, which is a shaking and bruising of the brain. There can be a concussion even without a loss of consciousness. If the child vomits, complains of a persistent headache or has difficulty moving an arm or leg in the first six hours, seek medical help, since these may suggest that the brain has been bruised consistent with a concussion. 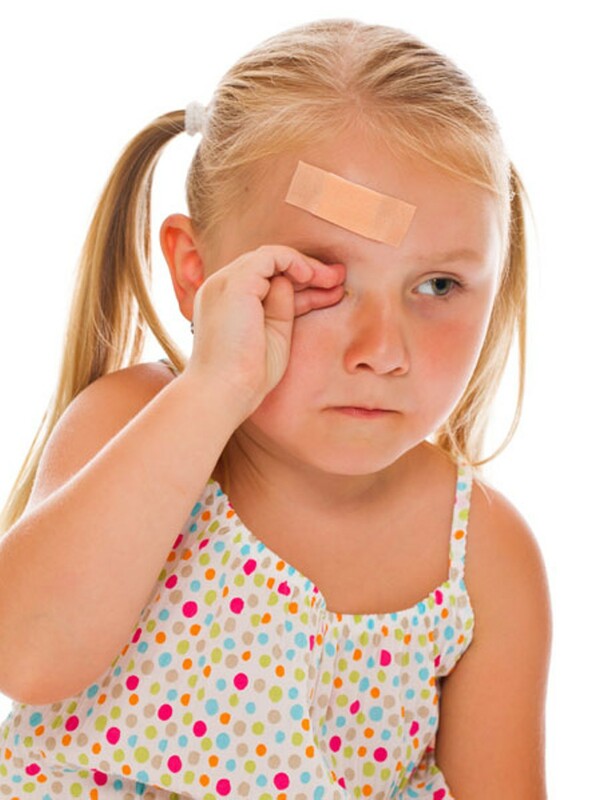 A bruise or "goose egg" on the forehead is a contusion; it doesn't necessarily indicate a brain injury or concussion. To treat a goose egg, apply an ice pack for 15 minutes of every hour while the child is awake, or at least the first several hours after the injury. After 48 hours, you can use warm compresses to speed the healing. KVT: What if a child faints after a minor cut? LF: Some people have a neurological response to the sight of blood and get a little queasy. Get your child to lie down as quickly as possible if he or she feels dizzy, then reassure him or her that it's a normal response to seeing something scary like blood oozing out of a cut or wound. Elevate the feet, as long as they can be moved; this helps the blood flow back to the brain. Fainting is not dangerous — unless the child lands on a sharp or hard object, causing further injury.